It's nearly a half hour long, but it's rather thorough. I've been working on a similar perspective correction illustration by aligning the features of the drawing relative to its "canvas" (i.e. the size and shape of the ossuary itself). 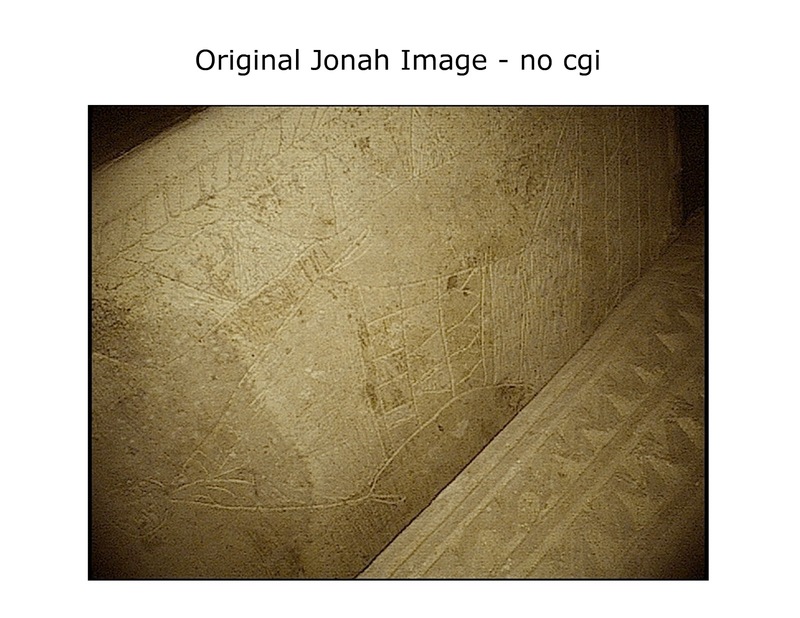 I first started out with image #14 from the "The Jesus Discovery" website as it is so far the most complete of the pictures released. 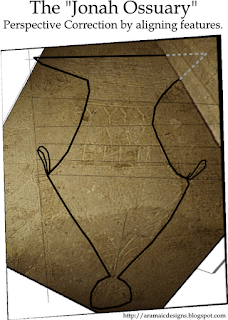 I essentially mapped out all of the perspective-relevant features: Lines that should be vertical and horizontal relative to each other, and then I mapped the "grid" that was created as flat as I could. 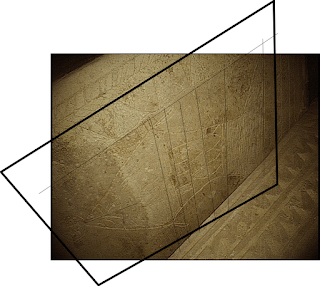 It's not perfect, as there is a little bit of distortion from the lens they used (in my next iteration I'll see if I can fix that) and I need to expand the right hand side a bit more; however, we can see that when the features are more or less aligned relative to each other, and the final frame is re-sized to something the proportions of its place on the ossuary, we get something very vessel-like, and not ichthymorphic at all. 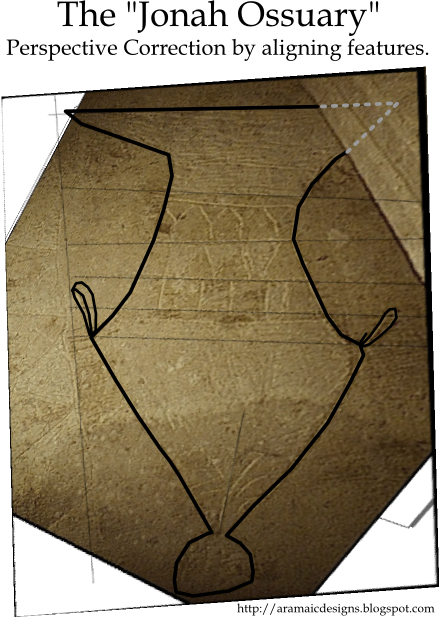 The rim is as wide as the hip of the vessel and "Jonah's head" is flattened to a half-spherical base. UPDATE March 23: Some additional illustrations for my discussion with Dr. Tabor in the comments. 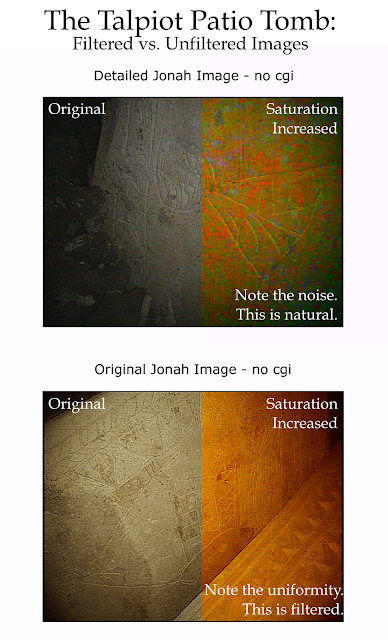 This illustrates how image #14 (on the bottom) is filtered compared to the "raw" image #15 (on top) where both are labeled "no cgi." This illustrates how the reproduction ossuary did not capture the proper shape of the head/base.